To change the display color of my Alpine CDA-7838 to match the orange instrument lights of my M3, I ordered some 0.12" red bulb covers from Parts Express to swap out with the original green bulb covers. Normally, this would be an easy swap with a detachable face plate, but 2 of the blubs are underneath the LCD, so I had to unsolder the LCD and remove it to swap the bulb covers out and then reinstall it (not an easy task for someone that's not familiar with soldering and electronics). 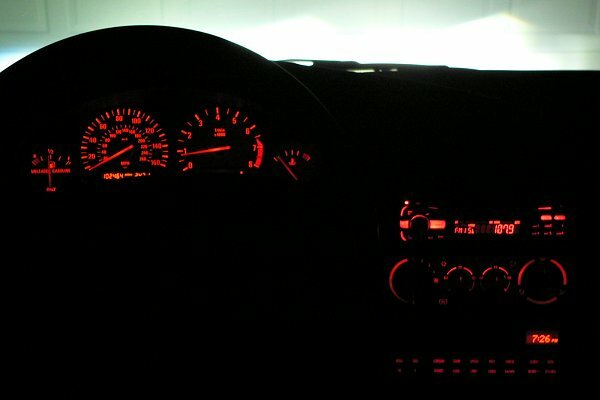 As I said, the bulb covers are red, not orange, so they don't match the car's dash lights EXACTLY, but it's pretty damn close (much better than GREEN! ) and it looks really good in person.